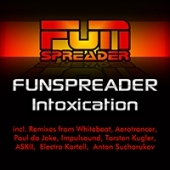 Right after the first few notes of the single release Intoxication off the album "10 Tracks", one hears the unmistakable Funspreader-style.This time it is the light and catchy melodies that are accompanied with a slightly hypnotizing touch. The name of the track also derives from this. With 15 songs, the single takes the listener on a journey made of phat club tracks and beautiful, atmospheric sounds. Thanks to the artists Whitebeat, Aerotrancer, Electro Kartell, Paul da Joke, Impulsound, ASKII, Torsten Kugler and Anton Suchorukov, the finest of remixes and special edits are offered.